Accuweigh 's Brisbane South branch recently responded to a breakdown call they received after a heavy duty axle weighbridge operated by Queensland Transport was flooded during torrential rains. 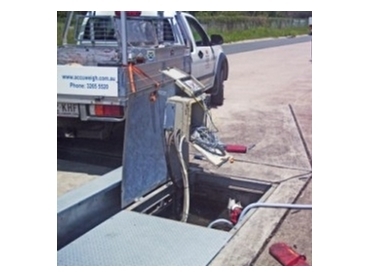 The axle weighbridge, located on the Pacific Motorway at Coomera in Queensland's South East, was totally submerged by a build up of groundwater on the weighbridge site. The axle weighbridge of 60t weighing capacity was fitted with a gravity drainage system, however this had become blocked after the pit had filled with groundwater. The responding Accuweigh team used a submersible pump to remove the water from the weighbridge pit. The junction box housing the axle weighbridge’s load cell cables and summing electronics was removed from the pit, and all components dried, cleaned and refitted. Testing indicated the four axle weighbridge load cells were fully operational and had suffered no damage from being submerged thanks to the high IP rating of QWM’s weighbridge load cells. The recent merge of Accuweigh’s Brisbane South operation with Queensland Weighing Machines based in Brisbane’s North generates increased operating efficiencies with all administration, sales and service activities now controlled from a new building in Geebung. Accuweigh’s existing service branch in Salisbury handles all service operations for Brisbane South clients with the new Geebung office handling all service needs in Brisbane’s North.